From it's beginning, The Bauhaus Megacorporation had a well-deserved reputation for engineering excellence and now, nearly 1400 years later, this reputation still holds true. During the colonization of the solar system, all the Megacorporations employed their skills in the construction of ships, atmospheric processing plants and gravity regulators. In addition to their industrial reputation, they were also recognized for their honourable business ethics. The Bauhaus Megacorporation rarely offered the most appealing deals and they were never the cheapest, but agreements signed with them were always honoured. As one might expect, the Bauhaus reputation for excellence extends onto the battlefield. Their military hardware is generally of a high standard and their mechanical and armoured support is notably superior to that of the other Megacorporations. 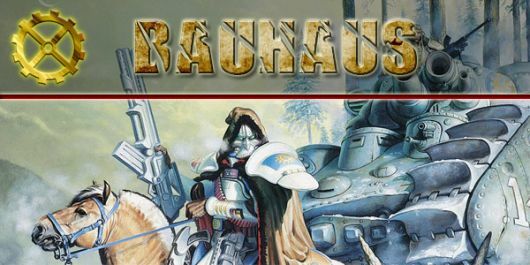 Combined with good discipline and highly trained troops, the Bauhaus army is one of the most effective in the solar system. Following the culture of military service the troops themselves are also well motivated and follow a code of honour that has earned them respect throughout the Megacorporations.